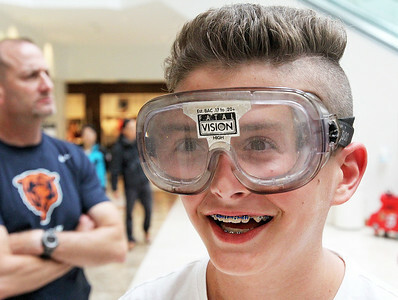 Candace H. Johnson-For Shaw Media Sam Cusumano, 12, of Gurnee tries on drunk goggles during the 13th Annual Vernon Hills Law Enforcement Exhibition at Hawthorn Mall in Vernon Hills. 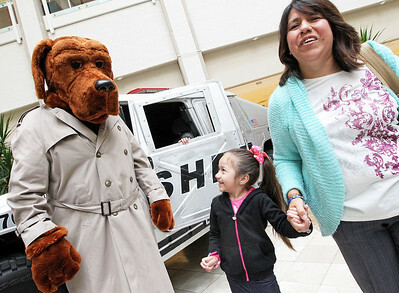 Candace H. Johnson-For Shaw Media Andrea Rodriguez, 5, of Vernon Hills looks at McGruff the Crime Dog one last time after she visited with him while holding her mother, Anna's, hand during the 13th Annual Vernon Hills Law Enforcement Exhibition at Hawthorn Mall in Vernon Hills. Candace H. Johnson-For Shaw Media Sgt. 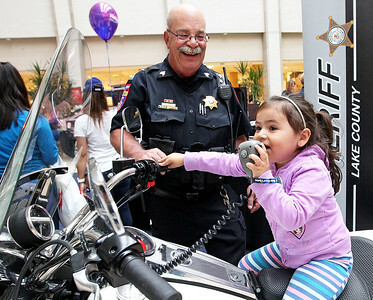 Glenn Smith, a Lake County Reserve Deputy watches Sophia Molchanov, 3, of Vernon Hills pretend to use a walkie talkie on a Lake County Sheriff's motorcycle during the 13th Annual Vernon Hills Law Enforcement Exhibition at Hawthorn Mall in Vernon Hills. Candace H. Johnson-For Shaw Media Lake County Sheriff Deputy Roman Buchberger talks with Gemma Giangiorgi, 5, of Lake Forest about the squad car they are sitting in during the 13th Annual Vernon Hills Law Enforcement Exhibition at Hawthorn Mall in Vernon Hills. 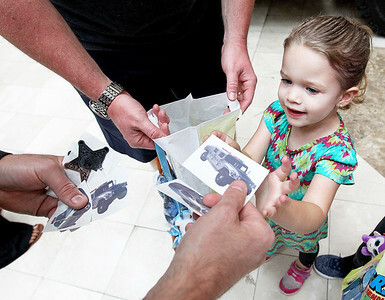 Candace H. Johnson-For Shaw Media Julianna Jensen, 3, of Round Lake stands next to her father, Wes, and sister, Isabella, 10, as she gets stickers and tatoos from Peter Grzeda, with the Lake County Sheriff's Office, during the 13th Annual Vernon Hills Law Enforcement Exhibition at Hawthorn Mall in Vernon Hills. 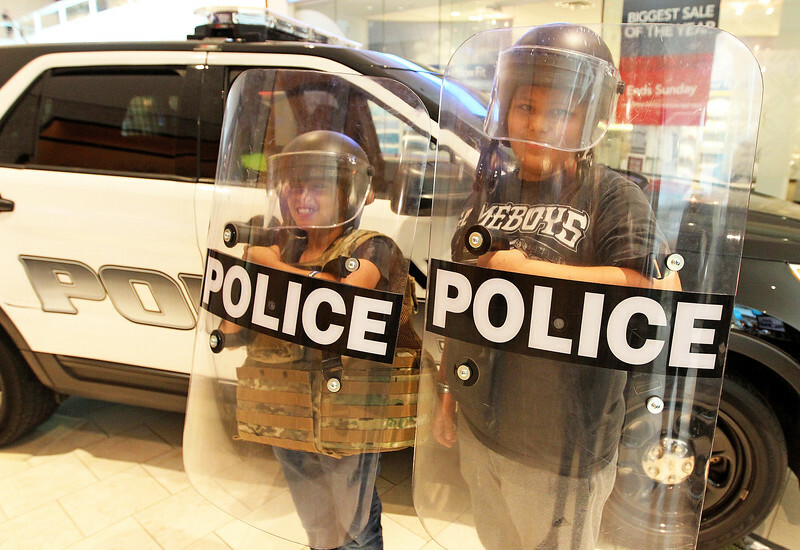 Candace H. Johnson-For Shaw Media Nicolas Ortiz, 9, and his brother, Manuel, 11, of Waukegan try on riot gear from the Zion Police Dept. during the 13th Annual Vernon Hills Law Enforcement Exhibition at Hawthorn Mall in Vernon Hills. 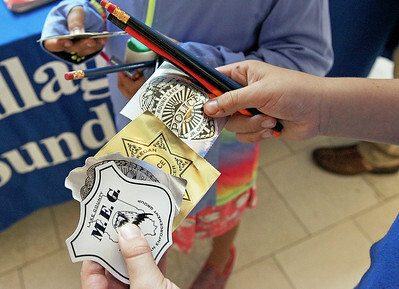 Candace H. Johnson-For Shaw Media Katie Reyes, 8, of Round Lake and her brother, J.J., 10, show off the stickers they received during the 13th Annual Vernon Hills Law Enforcement Exhibition at Hawthorn Mall in Vernon Hills. 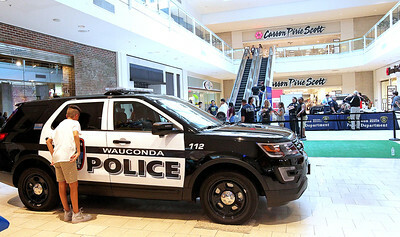 Candace H. Johnson-For Shaw Media Sam Cusumano, 12, of Gurnee looks inside a Wauconda Police SUV during the 13th Annual Vernon Hills Law Enforcement Exhibition at Hawthorn Mall in Vernon Hills. 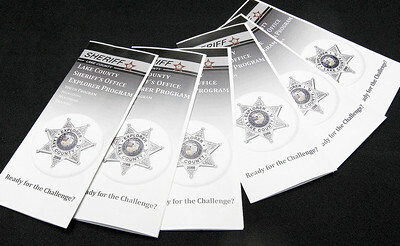 Candace H. Johnson-For Shaw Media Brochures from the Lake County Sheriff's Office about their Explorer Program sit on a table for the public to pick up during the 13th Annual Vernon Hills Law Enforcement Exhibition at Hawthorn Mall in Vernon Hills. Candace H. Johnson-For Shaw Media Maria Gjordeni, of Lakeview and Neil Baumann, of Vernon Hills sit in a Lake County Sheriff's Humvee during the 13th Annual Vernon Hills Law Enforcement Exhibition at Hawthorn Mall in Vernon Hills. 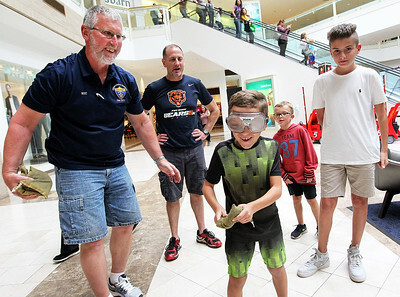 Candace H. Johnson-For Shaw Media Bert Gaide, of Lake Zurich, a volunteer with the Citizen's Police Academy, helps Calvin Cusumano, 7, of Gurnee play a bean bag game while wearing drunk goggles as his father, Mario, and brothers, Cole, 7, and Sam, 12, watch him during the 13th Annual Vernon Hills Law Enforcement Exhibition at Hawthorn Mall in Vernon Hills. Candace H. Johnson-For Shaw Media Sgt. 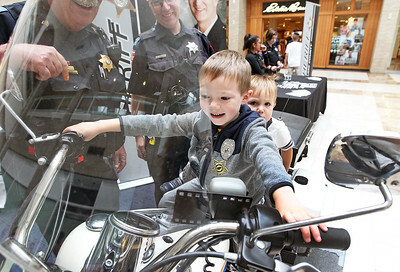 Glenn Smith and Drew Madden, both Lake County Reserve Deputies, watch Madden's sons Greyson, 5, and Kenny, 1, sit on a Lake County Sheriff's motorcycle during the 13th Annual Vernon Hills Law Enforcement Exhibition at Hawthorn Mall in Vernon Hills. Nicolas Ortiz, 9, and his brother, Manuel, 11, of Waukegan try on riot gear from the Zion Police Dept. during the 13th Annual Vernon Hills Law Enforcement Exhibition at Hawthorn Mall in Vernon Hills.